“We welcome today’s launch of the Global Ireland 2025 plans and the scale of the ambitions they aim to achieve over the coming years. 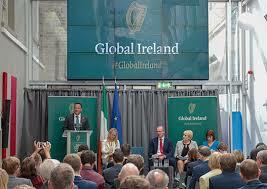 Chambers Ireland has previously called for various initiatives to safeguard and develop further Ireland’s international trade and diplomatic networks in the wake of Brexit and other international developments, from further investment to our embassies and state agencies abroad to our national bodies for supporting Irish businesses participating in global enterprise. The Global Ireland 2025 announcements aim to accomplish these initiatives which will ideally support the diversification of our exports and inward investment to compensate for, and mitigate against, any trade challenges which lie ahead. The Global Ireland 2025 Vision is the Government’s initiative to double the scope and impact of Ireland’s global footprint in the period to 2025. Being billed as the most ambitious renewal and expansion of Ireland’s international presence ever undertaken in terms of diplomacy, culture, business, overseas aid, tourism and trade. The Government has already announced new Embassies in Chile, Colombia, New Zealand and Jordan, and new Consulates in Vancouver and Mumbai. Strengthening our presence in the Middle East and Gulf region.